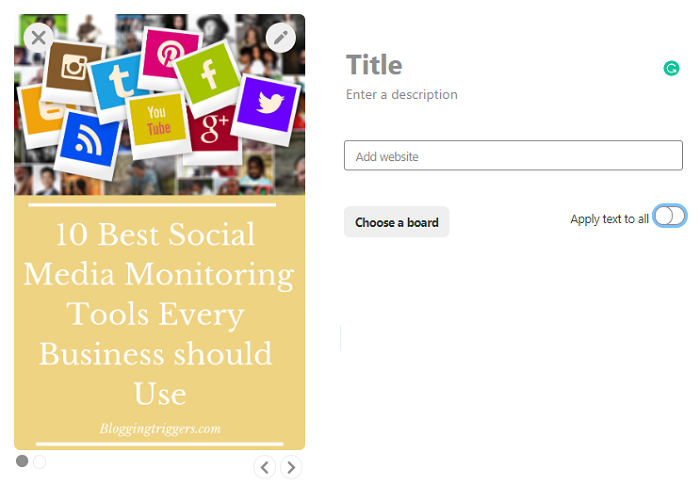 Creating image carousels is a popular way to include multiple images in a single post. It allows you to add up to five images that will appear in your feed one after another. They can have different titles, descriptions, and webpage links within the same post. A carousel rotates images radically with light 3D effects and thereby comes into your attention in a sudden moment. It is a perfect choice to improve your content exposure and user engagements. That’s the reason why we run social media marketing campaigns with carousel posts or ads which can ensure more impressions than others. When talking about social media promotions, Pinterest is our favorite place to drive traffic to the contents using images. Posting images at the right time is really important to get maximum page visits. We were using social media scheduling tools to publish posts at peak time until recently and now Pinterest added scheduling option as an in-built feature to manage pins without using any third-party tools. A carousel pin is another major development you will see soon on Pinterest. 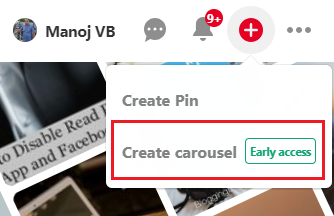 Today we’ll tell you how to create a carousel pin on the photo-sharing site. Sign in to your Pinterest account first. Click the ‘+” icon on the top-right corner of your screen. Choose ‘Create carousel’ from the menu. A new screen will appear with options to upload images for your carousel post. It supports both .png and .jpg image types. Pinterest recommends you to use 2:3 format images to improve their online visibility and clicks. Upload your first image and enter a title, description, and URL for it. Next, drag ‘Apply text to all’ toggle button to the left. Otherwise, it will repeat the same entries for all your images. You will see left and right arrows on the bottom right corner of the uploaded image. Click the right arrow to upload your next image. Pinterest lets you upload up to five images to the carousel post with unique titles, description, and URL address. When finished, choose a Pinterest board to which you want to pin the carousel image. Save. That’s it. Open your board to view the post.